Whether you’ve survived it, known someone who has survived it, or are just a kind and decent human being who acknowledges violence is never the answer, you’d probably be overjoyed to make domestic violence a thing of the past. But the task seems so monumental that you may wonder how you can possibly make a difference. The truth is, any societal change starts with just one individual standing up and doing the right thing. And it might be easier than you think. Here are five ways you can make a difference in your community today. 1. Talk to Children About Healthy Relationships. Studies show that educating kids and teens about abuse can end the cycle of domestic violence later in life. This can be done, in part, by modeling healthy relationships in your home so children—whether yours or others—can see what loving interactions look like. This also includes taking a stand against spanking. As children grow closer to dating age, start talking to them about respectful relationships, setting boundaries and dating violence. Keep communication lines open so they feel comfortable coming to you with questions on the subject. Encourage them to talk to their friends about the subject, too. 2. Check Your Workplace Policies. Given the sobering statistics on domestic violence in the U.S., including the fact that one in four women will be affected in their lifetime, the chances are high you work with someone who is dealing with an abusive partner. Check your company’s policy on domestic violence. If there isn’t one, or the one in place is weak, work with your HR department to create a well-rounded policy that addresses such specifics as time off for dealing with court proceedings or healing from injuries, security measures the organization will take on the employee’s behalf and flexible schedule or work location options to help a survivor avoid his or her abuser. Some companies even have furnished apartments survivors can use as safe havens until they can find alternate living arrangements. Survivors down the road will thank you that this is ready and in place for them. 3. Call Your Local and State Representatives. Familiarize yourself with your state’s domestic violence laws, and research your state’s domestic violence coalition or task force. If there are any related bills currently in the legislative process, call, email and send letters to your state senators and representatives telling them how you feel they should vote on the topic. If there aren’t any bills in the works addressing domestic violence, or related topics such as allowing abusers to collect alimony, put forth your own! Identify a congressperson to sponsor a bill and work with him or her to get it authored and, hopefully, passed! 4. Become an Unofficial Spokesperson for the Movement. Awareness is everything when it comes to social change. Talk to friends, co-workers, anyone who will listen about domestic violence. 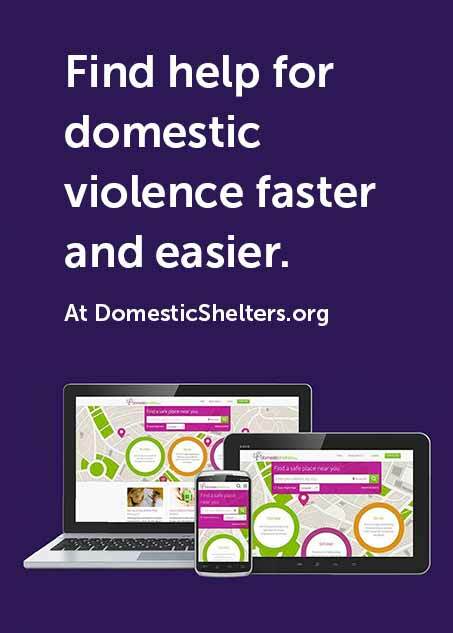 Create—and hang up—your own, custom-designed domestic violence posters here (the design is free, but you do have to print them yourself), and help to educate the public in your workplace, at the gym, in church, at community centers. 5. Lend a Hand In Fundraising. Domestic shelters and anti-violence organizations rely on donations to support survivors and lobby for change. Consider starting a Kickstarter or GoFundMe campaign and donating the proceeds to a local shelter or advocacy group. Or, encourage your family, school, workplace or church group to adopt a shelter through the DomesticShelters.org Wish List program. Want to get more hands-on? Participate in a march, walk or vigil in your city.